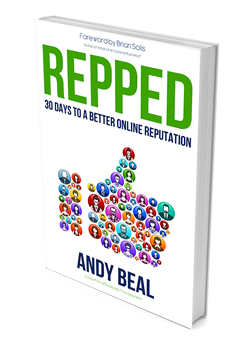 Andy Beal’s bestselling book, Repped: 30 Days to a Better Online Reputation, is a practical 30-day guide to building, monitoring, and repairing your online reputation. With dozens of examples and case studies, Repped demonstrates how a better online reputation can lead to improved job prospects, happier customers, fewer detractors, and most importantly of all, greater income. Andy Beal is coauthor of the first book to outline online reputation monitoring and management tactics for business and individuals. Radically Transparent explores why reputations are being defined by consumers using blogs, social media, and other web content. 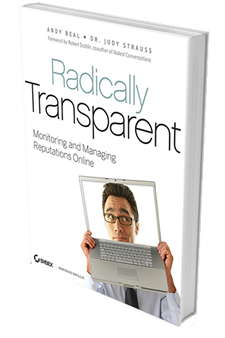 Using real-world examples, Radically Transparent explains why the internet is important to your reputation; how to use press releases, blogs, search engines, email, and social networks to build your good name; tools you can use to monitor conversations that include your name; and, a blueprint for defending your reputation and repairing it when you make a mistake.